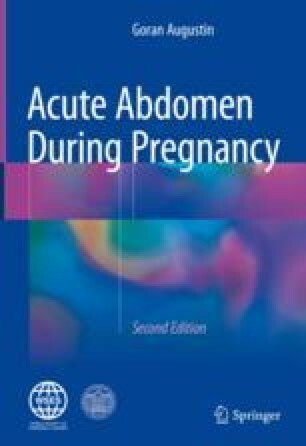 Almost all surgical complications related to spleen during pregnancy include significant intraperitoneal bleeding. The symptoms commonly include acute and severe abdominal pain with progression to hypovolemic shock. The problem is that these patients do not have any underlying disease or did not have similar symptoms previously. If abdominal trauma is not the cause, abdominal sonography rarely finds the cause of free intraperitoneal fluid. Emergency exploration is the mainstay of therapy to find the cause and stop the bleeding. Currently, interventional radiologic techniques are used to stop splenic bleeding if diagnosed, with the advantage of avoidance of surgical operation. If interventional radiologic techniques are not successful, surgery for the cessation of bleeding, commonly in a form of splenectomy, is the ultimate measure. The diagnosis of splenic bleeding and intervention should be made early to save not only the fetus but also the mother.